Tighmert is an oasis set in a broad desert plain with barren, steep hills on either side. Exactly the kind of countryside I like, and great for hiking, running and biking. 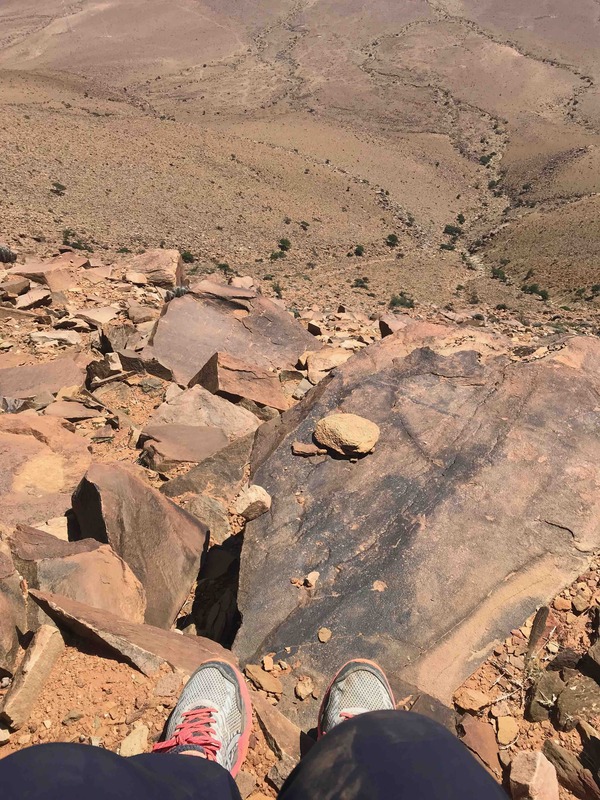 I had done a couple of preliminary hikes and short runs towards the hills and decided that I would like to head for the far end of the ridge, ascend and then traverse back along the ridge, descend beside my friends the nomads for a glass of Sahara tea and walk the last couple of kilometres back into the oasis. I set off with plenty of water and with a Rohan light wind-proof jacket for the top, but I didn’t bother with any food because I had eaten a massive breakfast of porridge with dates and walnuts, and I thought I would be back by around 2pm. I told my neighbour, Debbie, where I was going and said I would check in with her from on top of the ridge and then at the bottom again to be sure I was safe. The walk across the plain was soothing and soft on the legs. When there isn’t much to see, you focus on all the small things: a yellow-bellied bird, a small orchid-like flower, clusters of seashells left there millenia ago. But it was long, much, much longer than I had anticipated. In fact, my start point for the ridge was 12km away. Obviously this was going to be a bit more of an adventure than I had planned, but I let Debbie know I was going to be later, switched my mobile to airplane mode to save the battery and started at the base of the hill. I decided that I would take the steepest scramble for the fun of it and headed straight up. I had on Asics Gel Fuji Trabaco 5 trail shoes which are really good for these dry, rocky conditions. Going up was a clamber, and I was huffing and puffing by the time I got to the top. It was a hands and feet job and a straight 500m. By the time I’d got up there, the day had worn on, and I was starving. Fortunately, the wind was so loud I couldn’t hear my tummy rumbling. I set off along the ridge and kept as close to the edge as possible. It wasn’t a very practical plan. The ridge was an up and down walk with no clear path or trajectory, and I found myself on a steeply-sloping side which made it hard going. After about an hour and a half, I realised that I was going way too slowly to make it to the end of the ridge, or even half way, by dark, and I looked for the shortest route down. That’s when I scared myself. Why was I scared? There were two things: first of all I was on my own and hadn’t seen another person for the last four hours; secondly. the surface of the descent was both quad-burningly steep and mouth-dryingly gnarly. I was following the path of a landslide, and the side of the mountain kept slipping down from under me as I descended. My fear stemmed from the very real possibility of slipping and breaking or twisting something and then being stuck without any easy way to get help or get back. So, I’m sitting there collecting my thoughts and there is only one option – I have to be brave. How to be brave? Having no choices is a good start. I set off down the slope and immediately my feet give way under me and the rocks and stones bound and clash to rest about 100 metres down. 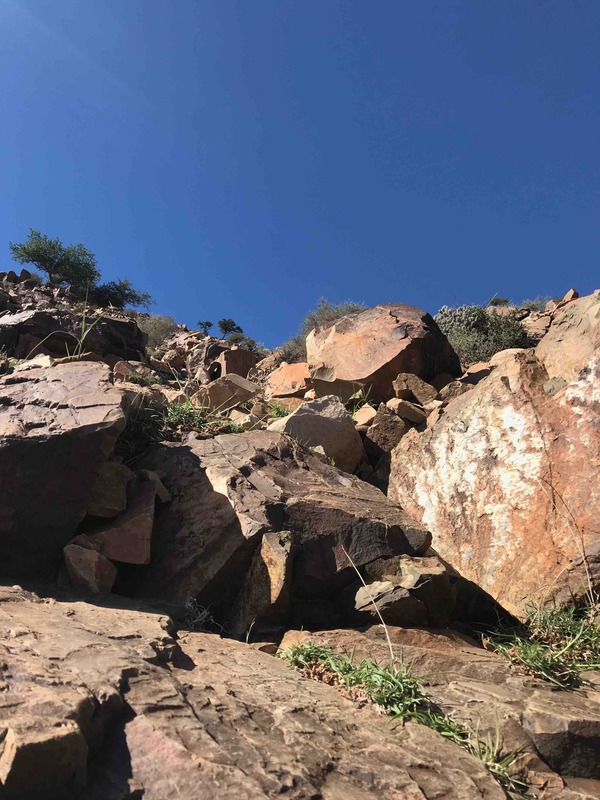 Cautiously I keep going, zigging and zagging where there seems to be a gentler part and then heading straight down when the boulders are big enough to (I hope) not give way. My heart rate is high, I can see it on my watch – a Garmin Fenix 5S – and, oddly, watching it, actually calms me because it distracts me from catastrophising. I can feel all the adrenaline buzzing round my body and a slight dizziness from having to constantly look straight down a sheer slope. To combat it, I fix my eye on landmarks and next stages I can reach: the juniper tree, the flat rock, the hollow with the yellow flowers. I concentrate on those. Every time I reach one, I throw a mini celebration party for one. It’s by accident that I discover my next aid in my “how to be brave” arsenal. Twitter! I had sat down on the flat rock and decided I needed a mental break. Twitter did the job. I had 3G and could indulge my need to read about the latest twists and turns in Arie’s completely fake love conundrums on The Bachelor. It didn’t help me when I had to set off again, however. The descent was unending but as I got lower, the gradient eased and I could make better time. Finally, I was at the bottom. I messaged Debbie to tell her I was down but had a 12km hike back so would be a while. I also realised that an hour and a half on the ridge had progressed me about a measly 200 metres from where I had started. The way back was flat and easy, and as I strode out, enjoying the late afternoon sun and letting all my flight and fight hormones work their way out of my body, I thought about what I had learnt. A few things were obvious. Next time I’ll take a Spot Tracker – a little satellite tracker that will show exactly where you are at all times if something does happen and someone needs to come and get you. That would get rid of that worry. Also, I had underestimated distances and times and so was underprepared – especially by not having any food – so next time I’ll do a bit more research before I plunge off, or at the very least always pack some dates and nuts. Then there was the “brave” bit. In truth, I hadn’t been really brave, I had just had no choice but to overcome my fear. I did find that certain things helped me though: taking it all at my own slow speed, thinking about where to put my feet and maintaining as much contact as possible with the hill; setting small targets; and taking mental breaks. If you enjoyed this story, there are lots more in my books. The writer and mountaineer Hamish Brown once said that experience is the sum total of your near misses; today you added to your experience. That moment 🙂 … Okay now it’s time to redo it over and over until it becomes so easy. But please Alice bring more food/water and, the Spot. Well done, Alice. Take more care next time. You are really brave, Alice! Thanks for your stories!